Idahoan potatoes have been in my family for years. When I first stopped eating meat, I went through a box of Idahoan Instant Mashed Potatoes a week! I was eating them daily for lunch and dinner. They taste great, very real and are so easy to make. Now, Idahoan introduces Steakhouse Potatoes. 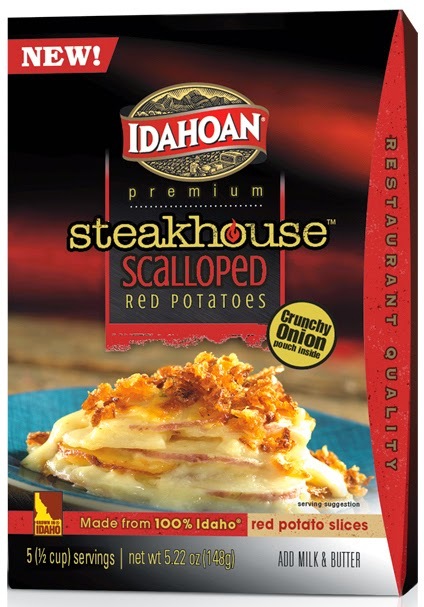 Idahoan Steakhouse Scalloped Red Potatoes start with world-famous Idaho® red potato slices in a premium cheese sauce, then finish with a topping of crispy onions for an irresistible crunch! These Steakhouse Scalloped potatoes will add premium restaurant quality flavor to any meal. When I made them, the whole family was really impressed. They are creamy and the slices of red potato are thick and delicious. In 1 1/2 qt casserole dish, combine potatoes, contents of sauce pouch, 2 Tbsp butter, and 2 cups boiling water. Add 1/2 cup milk and stir to combine. Bake uncovered at 450°F for 25 minutes. Sprinkle crunchy onion topping on top of potatoes. Let stand 5 minutes, then serve. 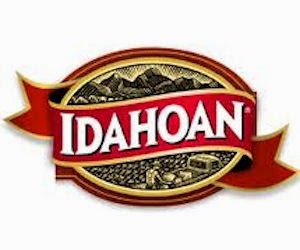 You can purchase Idahoan Steakhouse Potatoes at most grocery stores.